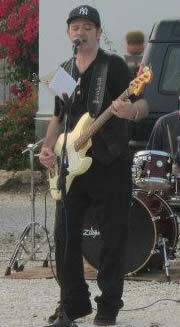 Terry Roberts is the vocalist and lead guitarist of the band. He's been around bands and music for more years than he cares to remember, although in this band he is actually the youngest member! Of course, he wasn't always the lead guitar player, only just having taken over in that guise following the departure of the band's long-time guitarist, Brad in April 2017. With well over thirty years of playing behind him, Terry has been in a variety of bands since he was at school in Tottenham, North London in the 1970s and played many venues in and around the capital. 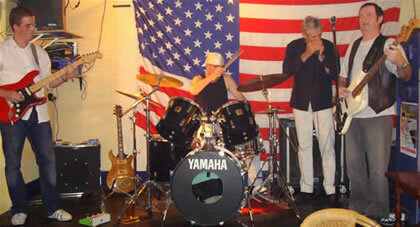 In the summer of 2002 Terry Roberts joined the "Catfish Blues Band", fronted by actor and singer Eddie Webber (of the movie: "Oh Marbella!" fame), guitarist Paul Newman and drummer Stuart Belcher. This band gigged in some very nice places including the chic Marbella beach resort of "Silks on the Beach", where they played at the end of filming party for the "Oh Marbella!" team (pictured right). At the end of 2002, the band split up, so Terry and Paul joined the Mama Paula Blues Band which was to prove to be a very interesting move. The band consisted of Mama Paula, the legendary blues/rock guitarist (at least here in Spain), Terry on bass and vocals, Paul on guitar, harmonica and vocals, "Chicago" Jim Greene on electro-acoustic guitar and vocals and Miguel Morales (the only Spaniard in the band) on drums. In a roller coaster ride that lasted nearly three years and saw this band change as first Paul, then Jim left to pursue other interests. The (now three-piece) group gigged prolifically, often working four or five nights a week in peak periods, which for the Costa del Sol is pretty amazing considering the glaring lack of decent live music venues. 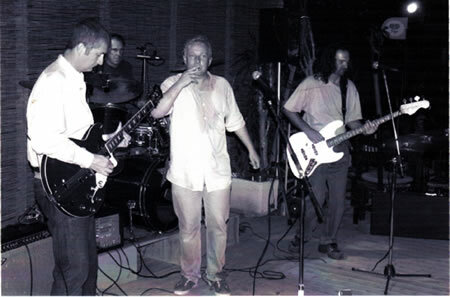 The Mama Paula Blues Band played every Monday night at Biddy Mulligans, a large and popular bar in La Cala de Mijas for over two of those years always to a large and appreciative crowd. Other regular venues included every Friday night in Joe Bar (a popular bikers bar in La Cala), alternate Thursdays in The Cotton Club, a twice monthly Saturday in Sal's Paradise and once a month at The Eagle Bar in Fuengirola. Other venues that they played repeat bookings at were The Sports Bar in Los Boliches, Biker Town in Estepona, Mario's Nightspot in Cabopino, several smaller bars in Calahonda, Coín, Monda, Alhaurin el Grande, Alhaurin de la Torre and also Málaga. Added to these were the bigger gigs that included a regular annual spot at the La Cañuela Blues Festival at Periana. This was a very popular gig at which big names such as Arthur Brown and Lena Lovich headlined and drew in pretty big crowds to this small countryside town. Added to the list was the massive Joe Bar annual Bikers Event in La Cala. This attracted over a thousand bikers each year and was a really popular and was great fun to be a part of. The last of these was the biggest of them all, held in a huge marquee complete with big stage and sound system. The band were joined on stage by pianist and entertainer Peter Donegan. Some of you will remember his late father, Lonnie (yep, really!). Lonnie used to visit The Music Factory when his sons were students there... and even sat in on a few of the Catfish Blues Band rehearsals in 2002. He thought we were pretty good and loved our music! Added to the list of big name support gigs, the band played a large charity event in Sotogrande headlined by "Dr Feelgood" and attended by several hundred people. They also played at each of the after gig parties for legendary performer Van Morrison and 70s/80s singing star Deborah Harry at the popular beach bar "Silks on the Beach" in Marbella, after which they took a regular Saturday afternoon gig there through the summer of 2004. As an aside and to keep busy during the day, Terry also found himself teaching guitar and bass guitar at a local English run private music school in Fuengirola, called The Music Factory. 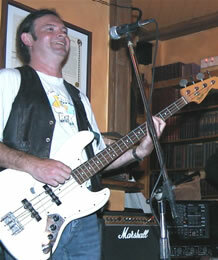 Steve is a very talented local bass guitarist who was currently playing with a local covers group "Sounds familiar". Together Terry and Steve played as an acoustic duo with Terry on electro acoustic guitar and vocals and Steve on electro acoustic bass and backing vocals, twice a week in a small bar called El Vagabundo, in Los Boliches. During this time, Terry and Steve also formed the three piece rock band "Dutch Courage" (the name of a band Terry was a member of in the late 1970s). 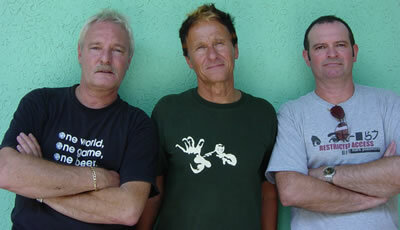 The band consisted of Jon Lloyd (left in the picture) on drums, Steve (centre) on bass and Terry (right) on lead guitar and vocals. They gigged in a few bars along the coast but were fairly short lived with Steve having to leave to return to the UK. During the same time, Terry went back to the bass guitar and joined a Madness tribute band, the seven piece "One Step Beyond" and played several gigs along the coast, most noteably in Sal's Paradise in Fuengirola, Aguamania in Coín and The Monte Carlo in Benalmadena. This was also fairly short lived as keeping seven musicians together is an almost impossible task! In early 2006 he joined one of the coast's most proficient guitarists, Marcelo Saenz to play bass for their Rolling Stone tribute band, "Get Stoned". This also had some success with several gigs in a variety of locations up and down the coast until it came to an end at the end of 2006. Terry dropped out of the music scene altogether following this and did not reappear until 2008 when he returned to Biddy Mulligans playing bass with the Music Factory band, "So Far So Good". At the same time, he also got the call from drummer Tony Bryant asking if he'd be interested in forming a small blues outfit along with guitarist Simon Barraclough, called "Tin Shack Blues". 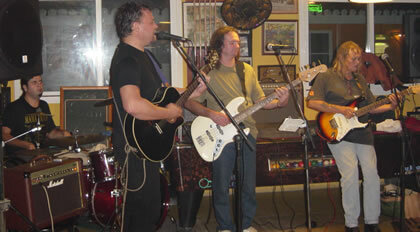 They played a regular Sunday afternoon gig in Montemar at a bar called JC's Bar. The gig attracted a small regular clientelle but never any big crowds. They were often joined by Simon's father Dave on guitar and also had guest appearances by Marcelo Saenz and blues singers Cat and Paulinda. ...and into 2013 we finally settled on the name "Karma"
2014, 2015 passed with "Karma" still going strong and now we're into 2016 and getting ready to keep on keeping on! ...and now into 2017, "Karma" is still the name but the line-up is rather different now. Terry has switched from bass to lead guitar and is using the experience to bring more original songs to the table that he can play the main melodies in his own rather unique, creative way. If you want to see him in action, you'll need to go see "Karma" play live and pleasantly surprise yourself. Whatever you do, do NOT miss it!